Thinking of starting your solar journey? 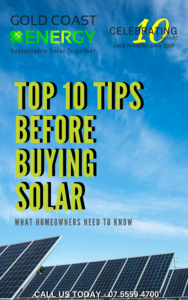 Read through this Beginner’s Guide to Solar Energy before purchasing a solar power system. This will ensure you have considered every criteria before making the switch to solar! Reduce your electricity bill: By harnessing the energy created from the sun, you only need to draw on the electricity stored in the grid when needed. Even this can be avoided with the advancing popularity and technology of solar batteries. With solar batteries, you can store your solar energy and become self-sufficient. Go green: Using renewable energy significantly reduces your home or businesses greenhouse gas emissions. Put safety first: Solar energy is a completely safe and reliable source of energy. As long as the sun is shining, you will have clean electricity in your home or business. 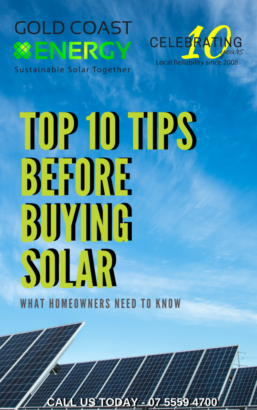 Now that you understand the main benefits from solar energy, here are some things that you will need to consider before purchasing a solar system. You will need to assess your household electricity consumption. Consider whether solar is a worthwhile investment for you and your family. Gold Coast Energy is more than happy to help you in assessing whether solar investment will save you money. It can be difficult for anyone to wrap their head around the technical aspects of a solar system. This alone can be enough to deter people from purchasing. For this reason, it is important to know the exact type of system you require and why that is the case. The Solar Inverter, which will convert the direct current (DC) to alternating current (AC). This is what will be used in your home as electricity. Grid-connected Solar: These systems are the most commonly installed within Australia. Grid-connected Solar with battery backup: Due to advancing technology, this option is becoming more popular among new installers. By installing a solar battery, you can enjoy an uninterrupted power supply. This means you can use your stored solar energy at night (when usage is usually the highest) without impacting on your electricity bill. Stand-alone Solar: These systems are most commonly installed in remote areas. These systems do not connect to the electricity grid. Currently, installing a Solar System for your home is now the most affordable it has ever been. It is most common to purchase the system up front to finance it. Gold Coast Energy currently provides market leading finance options. No solar system is the same, as there are many variables that will impact the cost of your system. These variables can include the size or type of system, framing requirements, whether roof access is required etc. A Gold Coast Energy expert will visit your home or business offering a free assessment and quote. Feed-in Tariffs reflect how much money you will be paid for every kilowatt of energy that your system feeds back into the electricity grid. Your home will use the energy it produces first, with any excess electricity being fed back into the grid. Feed-in tariffs vary from state to state and from different electricity retailers. To identify your feed-in tariff, contact your electricity retailer directly. To access the best feed-in tariff rate possible, shop around to see which electricity retailer is offering the best rate. Now that you know what system you need and how it will work, it is time to choose a solar installer. Currently the best tool for consumers to choose a retailer is the Clean Energy Council (CEC) Solar Retailer Code of Conduct. This tool will ensure you choose an installer that is committed to offering you a quality solar system with a high level of service. Selecting a CEC approved solar installer is one way to ensure you select a company that prides itself in being an industry leader. Gold Coast Energy employs Accredited Clean Energy Council Installers and has successfully obtained the ISO 9001 in Safety Management System. We are also a Tesla Authorised Installer and Certified Retailer. Gold Coast Energy has been installing and servicing residential solar in South-East Queensland and Northern New South Wales for 10 years. Firmly positioned as an industry leader, we take comfort knowing you are being looked after by one of the most established solar companies in Australia. Our commitment to exceptional customer service and results is why our customers keep referring us to their friends, family and other businesses. We welcome you to visit our testimonial page to hear from members of the community. Finally, now that you have chosen your installer, what size system should you choose? In our opinion, a general rule to follow is to match your system size with your household consumption. However, our team of qualified, experienced and certified professionals will visit your home and design a system that will best suit your household. After choosing the system that best suits the needs of you and your family, we can finalise your contract and finance options. Your solar installation will then be booked accordingly at a time that suits you. The installation process will normally take no longer than one day. During the installation process, our technicians will require internal roof access for approximately 30 minutes. Gold Coast Energy will provide you with all the necessary documentation on the scheduled installation day. This documentation will include the warranty and a system user’s manual. Gold Coast Energy will arrange connection of your solar system. This process includes preparing and submitting relevant documentation that is required by your electricity retailer for meter installation and connection to the network. Congratulations! You have successfully installed a solar energy system and are cutting down your electricity bill. Although a positive impact, it is important to ensure you continue to maximise your solar investment. This process will involve proper maintenance and management of your system. It is important to ensure your system is operating correctly in order to keep you and your family safe and comfortable. In our professional opinion, GC Energy recommends a professional audit and clean every 12 months. This is an affordable way to get the most out of your solar investment. Dirty solar panels produce up to 30% less energy, so it is vital to ensure they remain clean always. At Gold Coast Energy, we do Solar 24/7. Not only are we a certified and reputable solar retailer and installer; we are a committed servicing company as well. We will provide you with exceptional service throughout your solar journey, from installation and beyond. If you need to make an insurance claim from storm or other damage, or you think your inverter may have a fault, all you need to do is contact our customer service team on 07 5559 4700. At this point, we will promptly assist you with all your inquiries, ultimately, giving you peace of mind. Many home owners, who are enjoying the benefits of roof top solar, at some point, start to consider upgrading their system. There are several factors to consider when installing and upgrading a system. When you initially chose your system, a Gold Coast Energy expert will visit your home to assess your current system and develop a plan to upgrade based on your individual needs and requirements. 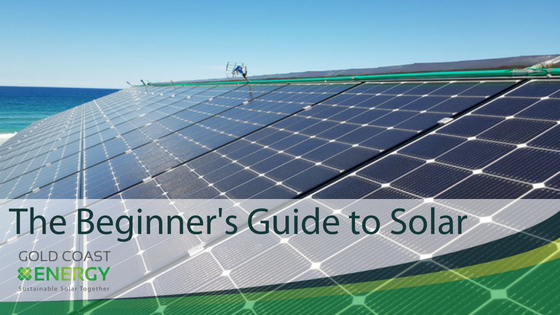 This concludes our comprehensive Beginner’s Guide to Solar. We hope this will take some of the confusion out of solar. We are committed to assisting you on your journey to enjoying free energy from the sun! For a free assessment and quote or have any questions regarding solar for your home or business please contact us on 5559 4700 or fill out the contact form below.